Although the author is not accredited, it was almost certainly the work of the publisher, Alexander Hume Ford. Riding the Surfboard at Waikiki Beach, Honolulu, Territory of Hawaii. A few more years and the art of riding the surfboard might have become one of the lost arts never to be rediscovered. Now that the motion picture ﬁlm tells the trick in every detail, even should the people of Hawaii neglect this art of the Sandwich Islanders of old, the motion picture will teach new generations how the secret of surfboard riding may be saved. How nearly the surfriding on boards came to extinction few realize. It was only in Hawaii that the Polynesian practiced the art of standing on a tiny plank, no longer than himself, and while he stood on his frail board urged it onward before the biggest rollers of the sea. Many years ago surfriding had died out among the natives of all of the Hawaiian Islands save Hawaii, Oahu and the little Island of Niihau. The Hawaiians have dwindled in a hundred years from 250,000 to less than a tenth of that number. But a handful on the big Island of Hawaii now practice surfboard riding, and it is doubtful if half a dozen of these can stand erect on the board while it is in motion. famous as the home of the most daring surfers. Niihau, great rollers miles across. There are still a few experts left who swim out a mile or so to sea and catch these big waves. Usually they do not ride the board before them, but after the wave is once caught glide the board on the bias until, beneath the hollow of the advancing wave, they are carried forward toward the beach, yet shoot along the face of the wave, at incredible speed, across the bay. It is beyond hope that another generation will produce on Niihau such skilled surfers. On the Island of Oahu it is doubtful if a surfboard has been launched for a generation, save at Waikiki beach. Here the sport of surfriding is kept alive, not by natives, but by white men and boys who have learned the sport within recent years. 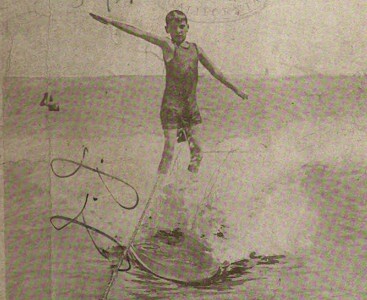 Nearly a decade ago, when it was known in Honolulu that Edison had sent a man to make motion pictures of the surfriding at Waikiki, interest was renewed in the old Hawaiian water sport. 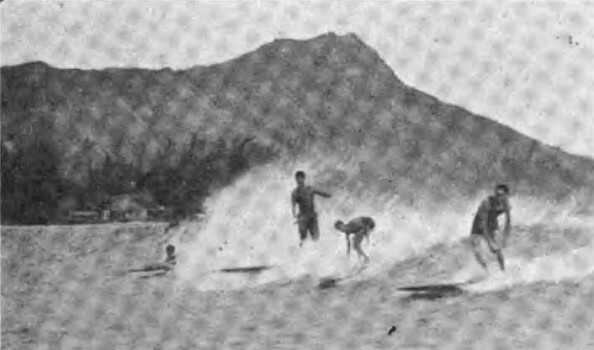 Men who had, as boys, learned to ride the board, became interested again, and those youngsters who lived at Waikiki beach began practicing on their long-neglected surfboards in anticipation of seeing themselves on the screen in motion. The pictures were taken, and once more interest died down, until there were very few who could ride the waves. Then came the invasion of the malihini, that is the “stranger” began to arrive. To him surfboard riding was a miracle. He wanted to accomplish the marvelous art to return to his native land and astonish his friends someday at the nearest seaside resort. But, alas! there were no teachers. Some newcomers did get together and organize the Outrigger Club, securing a place on Waikiki beach where surfboards might be stored and dressing rooms built. Once again the motion picture man became interested. told the whole world how they rode the surfboard in Hawaii. the novice how the wave was caught and mastered. The Outrigger Club was all ablaze with excitement. 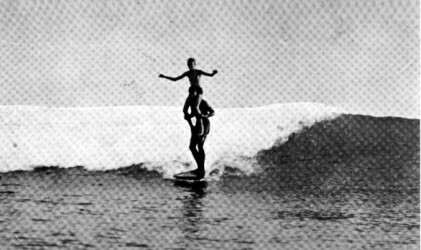 For two years its hundreds of members, especially the Juniors, had been striving to learn the tricks of surfriding, and many were eminently successful. 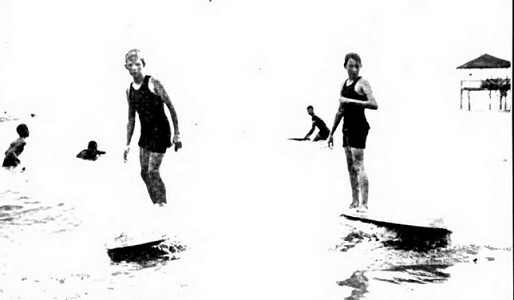 Surfriding became a white man's sport in Hawaii, and not a few young women and girls learned to master the surfboard. A great steel tripod was built for the representative of Pathe Freres, and this was carried far out on the reef into deep water. Here it was erected and a platform built just above the highest waves, and on this platform M. Bouvillain erected his motion picture camera. Here he caught the waves as they formed and the men and boys as they watched over their shoulders the oncoming roller, ready to paddle forward as the down-slope of the advancing roller began to lift their boards. 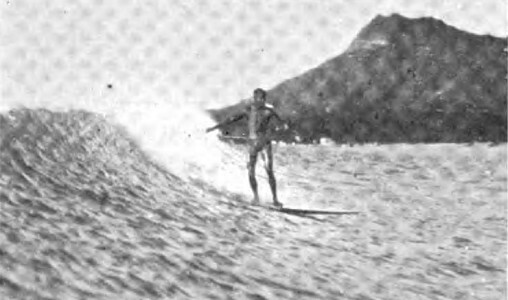 This was not all, however; the Pathe man began from the beginning; he made motion pictures of the riders approaching the surfboards on dry land, pictures of them launching their boards and paddling out to the big waves half a mile out at sea. 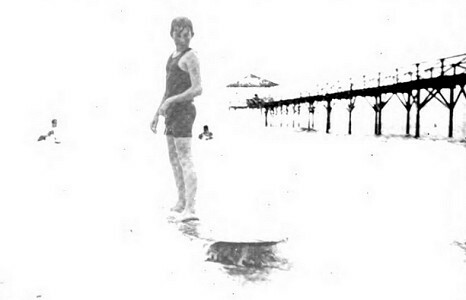 Every movement of the arms and legs was depicted—from start to ﬁnish; no motion could escape the rapid ﬁre of the ﬁlms; so that today as French may be learned from the phonograph record, so the swimmer may study the secrets of surfboard riding from the motion picture ﬁlms. The Start Out. Making Ready. 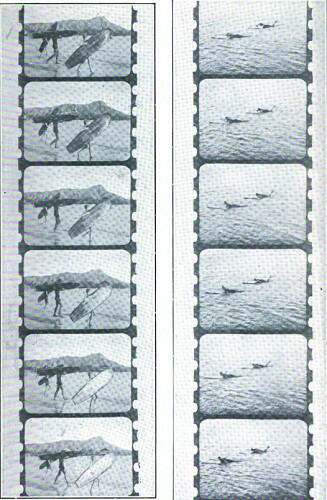 The motion picture is secured by making a separate photo each sixteenth of a second; these enlarged are projected on the screen at the same rate of speed. As it takes about the eighth of a second for the eye to clearly catch and retain a picture, by persistency of vision the picture on the retina is carried over and the jerky movement is reduced. In making natural color ﬁlms, the pictures are taken and projected at thirty-second of a second intervals, so that the color pictures appear to run more smoothly. In Paris there is a great international library of ﬁlms in the special vaults of Pathe Freres. positive of one of these ﬁlms and project the picture at any speed he may desire to closely watch the movements of the man and board in catching the waves. It is no sinecure to stand far out at sea on a frail platform, the surf rolling a foot or so beneath, and calmly turn the handle of the motion picture camera that must remain ﬁrm and steady on its tripod. M. Bouvillain did this once. After he had left the great steel tripod it collapsed and still lies at the bottom of Waikiki Bay, the waves rolling over it. Hundreds now ride the surfboard at Waikiki, and the next daring motion picture man will send down to posterity ﬁlms showing men on surfboards with boys standing on their shoulders, as well as of girls and women who have become expert surfriders. The next ﬁlm will doubtless show the surfriders and the scenes at Waikiki in all the richness of natural color. The motion picture has done much to preserve the art of surfriding, and fortunate is Hawaii to have the only safe beaches before which this sport may be indulged in the year round. 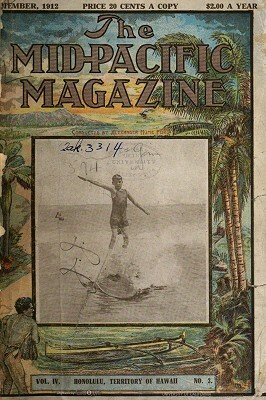 Geoff Cater (2010-2016) : The Mid-Pacific Magazine : Surf Films, Hawaii, 1912.